Despite going down 2 games to 3 in the ALCS, the Astros returned to Houston to close out the series, win the Pennant, and punch their ticket to the World Series. 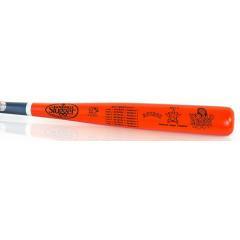 This full-size, Louisville Slugger World Series two tone bat is custom made and engraved to honor the 2017 American League Champion Houston Astros. Celebrate this great season by adding this unique collectible. These hand-crafted bats are made in America, and look great displayed on any wall in your home or office. Order yours before they are gone. Due to the limited release of this item we must charge your credit card for the full price immediately upon taking your order. This policy ensures we reserve a bat for you. We will confirm your order by email. This bat is not game used. Please allow 4 to 6 weeks for delivery. Astros 2017 World Series Louisville Slugger Bat $129.95 Sold Out!